Founded in 1917 as the Union Carbide and Carbon Corporation, from a merger with National Carbon Company, the company's researchers developed an economical way to make ethylene from natural gas liquids, such as ethane and propane, giving birth to the modern petrochemical industry. Before divesting them, the chemical giant owned consumer products Eveready and Energizer batteries, Glad bags and wraps, Simoniz car wax, and Prestone antifreeze. The company divested other businesses before being acquired by Dow Chemical on February 6, 2001, including electronic chemicals, polyurethane intermediates, industrial gases and carbon products. 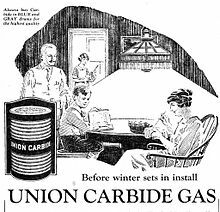 The Union Carbide and Carbon Corporation was formed on November 1, 1917, from the merger of the Union Carbide Company founded in 1898, the National Carbon Company founded in 1886, Linde Air Products Company, maker of liquid oxygen, and the Prest-O-Lite company, manufacturer of calcium carbide. In 1920, the company set up a chemicals division which manufactured ethylene glycol for use as automotive antifreeze. The company continued to acquire related chemical producers, including the Bakelite Corporation in 1939. The company changed its name to "Union Carbide Corporation" in 1957 and was often referred to as Carbide. It operated Oak Ridge National Laboratory from 1947 until the late 1970s. During the Cold war era, the company was active in the field of rocket propulsion research & development for aerospace and guided missile applications, particularly in the field of chemicals and plastics, solid rocket motors, and storable liquid fuels. R&D activities has been centered at the Technical Center near Charleston, West Virginia. The Aerospace Materials Department was established for the mentioned purposes within the company's Carbon Products Division. Ucar batteries was Carbide's industrial and consumer zinc chloride battery business. The business, including Energizer alkaline batteries, was sold to Ralston Purina in 1986, following a hostile takeover operation. In the early 1960s, Union Carbide Corporation began mining a newly identified outcrop of chrysotile asbestos fibers near King City and New Idria, California. These fibers were sold under the brand name "Calidria", a combination of "Cal" and "Idria," and sold in large quantities for a wide variety of purposes, including addition into joint compound or drywall accessory products. Union Carbide sold the mine to its employees under the name KCAC ("King City Asbestos Mine") in the 1980s, but it only operated for a few more years. Union Carbide India Limited, owned by Union Carbide (50.9%) and Indian investors (49.1%), operated a pesticide plant in the Indian city of Bhopal. Around midnight on 3 December 1984, methyl isocyanate (MIC) gas was accidentally released from the plant, exposing more than 500,000 people to MIC and other chemicals. The government of Madhya Pradesh confirmed a total of 3,787 deaths related to the gas release. It left an estimated 40,000 individuals permanently disabled, maimed, or suffering from serious illness, making it one of the world's worst industrial disasters. Union Carbide was sued by the Government of India and agreed to an out-of-court settlement of US$470 million in 1989. The plant site has not yet been cleaned up. Warren Anderson, CEO at the time of the disaster, and Carbide refused to answer to homicide charges and remained fugitives from India's courts. The U.S. denied several extradition requests. Anderson died on 29 September 2014 in Florida. Seven Indian employees of Union Carbide were convicted of criminal negligence in 2010 and fined $2,000 each. In 1982, Carbide's auditors warned of a possible 'runaway reaction'. Carbide didn't supply an antidote, maintaining that MIC was "nothing more than a potent tear gas". Carbide insisted the accident was an act of sabotage by a rogue worker. Union Carbide ceased operations in Australia in 1985. In 1987, the New South Wales Pollution Control Commission ordered Union Carbide to remediate the site. This work, which cost Union Carbide $30 million, was conducted between 1988 and 1993. The work involved excavation and encapsulation of the contaminated soil. In 2004, the New South Wales Minister for Planning granted consent for additional remediation of the former Union Carbide site to proceed, including parts of Homebush Bay. Approximately 900,000 tons of soil were excavated from the site, 190,000 tons of soil from the adjacent Allied Feeds site, and approximately 50,000 tons of sediment from the bay. Remediation of the Allied Feeds Site was completed in August 2009, Homebush Bay sediments in August 2010, and the Union Carbide site in March 2011. The cost of the remediation work was $35M for the Allied Feeds site, and $100 million for Union Carbide site and Homebush Bay sediments. In February 2018 it was announced that the former Union Carbide headquarters building and current headquarters of JPMorgan Chase at 270 Park Avenue in New York City, a 52-story modernist office building designed by renowned firm Skidmore, Owings & Merrill and completed in 1961, would be demolished and replaced with a new 1,200 foot tall tower serving as the consolidated headquarters for JPMorgan Chase. The project is significant because it proposes the demolition of an existing office building of extraordinary monetary value to better utilize the prime Manhattan location. Also, at 700 feet tall, the demolition of the former Union Carbide Building represents the tallest building in the world ever voluntarily demolished. ^ Robert T. Beall (1940). "Rural Electrification" (PDF). United States Yearbook of Agriculture. United States Department of Agriculture. pp. 790–809. Retrieved 2012-01-08. Of the more than 6.3 million farms in the country in January 1925, only 204,780, or 3.2 percent, were receiving central-station electrical service. ^ "About Us". Union Carbide Corporation. Accessed May 31, 2011. ^ Union Carbide Corporation, History Archived 2008-07-18 at the Wayback Machine, Accessed July 9, 2008. ^ "Swords to Plowshares: A Short History of Oak Ridge National Laboratory (1943–1993)". Oak Ridge National Laboratory. April 8, 2006. Archived from the original on December 1, 2012. Retrieved November 11, 2012. ^ Union Carbide Expands Rocket Propulsion Activities. // Missiles and Rockets, June 4, 1962, v. 10, no. 23, p. 39. ^ New Activities. // Missiles and Rockets, May 10, 1965, v. 16, no. 19, p. 41. ^ Warren, Susan (5 Aug 1999). "Dow Chemical to Acquire Union Carbide --- Deal, Valued at $8.89 Billion, Would Position Firm to Challenge DuPont". The Wall Street Journal: A3. ^ "Hawk's Nest Tunnel Disaster". West Virginia Department of Culture and History. Retrieved 2008-11-25. ^ "Redevelopment and Remediation of the Rhodes Peninsula" (PDF). NSW Leglisative Council. Retrieved 26 June 2014. ^ "Union Carbide Australia Ltd. (1950–1985)". National Library of Australia. Retrieved 21 June 2014. ^ "Environmental Impact Statement - Remediation of the Lednez site, Rhodes and Homebush Bay" (PDF). Parsons Brinckerhoff. Retrieved 27 June 2014. ^ "Assessment Report" (PDF). NSW Government - Department of Planning. Retrieved 29 June 2014. ^ "Former Lednez/Union Carbide Site & Homebush Bay Remediation". Thiess Services. Retrieved 29 June 2014. ^ "Former Allied Feeds Site Remediation". Theiss Services. Retrieved 13 July 2014. This page was last edited on 5 April 2019, at 07:45 (UTC).